Cork is an impermeable buoyant material, the phellem layer of bark tissue that is harvested for commercial use primarily from Quercus suber (the Cork Oak), which is endemic to southwest Europe and northwest Africa. 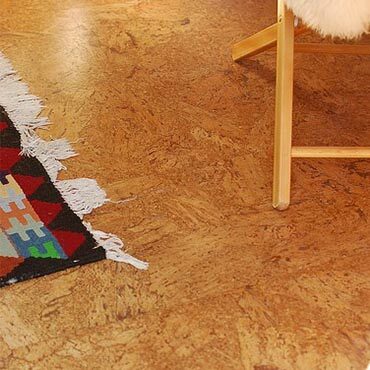 Cork is composed of suberin, a hydrophobic substance and, because of its impermeable, buoyant, elastic, and fire retardant properties, it is used in a variety of products, including flooring. The montado landscape of Portugal produces approximately half of cork harvested annually worldwide, with Corticeira Amorim being the leading company in the industry. Cork was examined microscopically by Robert Hooke, which led to his discovery and naming of the cell. There are about 2,200,000 hectares of cork forest worldwide; 34% in Portugal and 27% in Spain. Annual production is about 200,000 tons; 49.6% from Portugal, 30.5% from Spain, 5.8% from Morocco, 4.9% from Algeria, 3.5% from Tunisia, 3.1% Italy, and 2.6% from France. Once the trees are about 25 years old the cork is traditionally stripped from the trunks every nine years, with the first two harvests generally producing lower quality cork. The trees live for about 300 years. The cork industry is generally regarded as environmentally friendly. Cork production is generally considered sustainable because the cork tree is not cut down to obtain cork; only the bark is stripped to harvest the cork. The tree continues to live and grow. The sustainability of production and the easy recycling of cork products and by-products are two of its most distinctive aspects. Cork Oak forests also prevent desertification and are a particular habitat in the Iberian Peninsula and the refuge of various endangered species. The Cork Oak is unrelated to the "cork trees" (Phellodendron), which have corky bark but are not used for cork production. Cork is extracted only from early May to late August, when the cork can be separated from the tree without causing permanent damage. When the tree reaches 25–30 years of age and about 24in (60 cm) in circumference, the cork can be removed for the first time. However, this first harvest almost always produces "male" cork. Bark from initial harvests can be used to make flooring and other industrial products. The workers who specialize in removing the cork are known as extractors. Extractors use a very sharp axe to make two types of cuts on the tree: one horizontal cut around the plant, called a crown or necklace, at a height of about 2-3 times the circumference of the tree, and several vertical cuts called rulers or openings. This is the most delicate phase of the work because, even though cutting the cork requires quite a bit of strength, the extractor must not damage the underlying phellogen or the tree will be harmed. To free the cork from the tree, the extractor pushes the handle of the axe into the rulers. A good extractor needs to use a firm but precise touch in order to free a large amount of cork without damaging the product or tree. These freed portions of the cork are called planks. The planks are usually carried off by hand since cork forests are rarely accessible to vehicles. The cork is stacked in piles in the forest or in yards at a factory, and traditionally, left to dry, after which it can be loaded onto a truck and shipped to a processor. Sheets of cork, also often the by-product of stopper production, are used to make floor and wall tiles.